Given the millions of people who got Cs and Ds in their math classes, this isn't too surprising. If you want to get really depressed, look at adult literacy rates. depends on which rules you follow. if you do / and * before + and -, it is B.
TIL: There are alternative rules to do basic math. Not Dumb. More likely forgot/unfamiliar with mathematical order of operations hierarchy. with no exponential operations or parentheses in this example, perform multiplication & division first from left to right. then addition and subtraction from left to right. this makes the 60x0=0 piece drop out, leaving 60+1. This is why I've always hated math! How soon we forget PEMDAS! Not exactly my subject but is there really a correct answer without using parentheses/brackets? my pocket calculator says 1. my head say this is where mistakes are made. I have an M.S. in physics and I would never write an equation this way. It's not hard to put in some clarifying parentheses. I was terrible at math as a kid because of these silly "tricks" requiring memorization of random rules. We shouldn't be punishing kids and telling them they are stupid because they haven't learned to disambiguate a universal language properly. This sort of "gotcha" could be especially harmful to international students, or students from disadvantaged backgrounds. I agree. I write software for a living. Compilers have similar orders of operations rules. I know these rules, but I NEVER abuse them like this. I always put operations in parenthese, or even break out the operation into multiple lines with comments. I have to make sure that if I, or someone else, ever has to go back to debug that part of my code, there should be zero doubt or ambiguity about what it is supposed to do. every line of code has a comment line associated with it. I'm working on my B.S. in physics right now, and I agree with you. 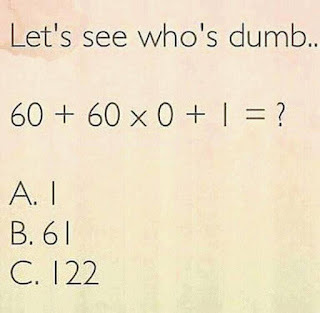 I use mathematics nearly every single day, and while I can easily come up with the answer, I'm always baffled by the abuse of notation in these kinds of posts. 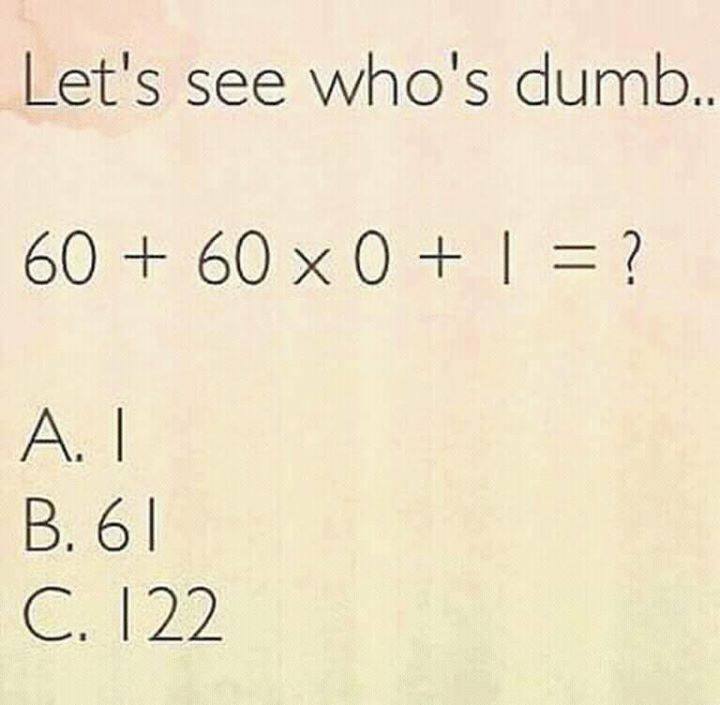 There's no need to write a math problem like this. Math is a language, and it is up to the author to make the meaning clear to the reader. Repetition is important in any learning environment, so, I say…. "I don't understand the question at all, I do not know what 'math' is. I did very well at mathematics at school, top of the class right up until I started to notice girls, but we called it maths for short, because that is how you abbreviate the word mathematics. When there is a universal language for both the maths and words, life will be less annoying, especially for ME. Everything evolves or becomes obsolete. The North American habit of trying to distance itself, language wise, from British rule is getting a bit tiresome (should that be tyresome ?) and I for one cannot contain my anticipation of the day when y'all just give up and spell words properly. If you are going to sound the h in the French word hospital, you really need to sound the h in the French word herb, like everyone else in the 'English' speaking world does, excluding the French. While I may have intentionally digressed from the maths topic at hand, I feel that is ok as it is important to educate my friends across the Pacific Ocean. English is the language of the internet and I am fluent in the use of that language, so please, for the sake of my enjoyment of my morning coffee, could you all make an effort to speak and write as I do. P.S. Stating your weight in GBP is confusing. P.P.S. Any measurement that has the base of 12 is silly and cumbersome. Make sure you have the best Christmas you can ! Here in New Zealand, an English speaking country where we drive on the left side of the road, have speed limits in kilometres, fuel in litres, money in dollars (and did you know, the dollar is a metric system ?) it is summer, with Christmas day normally being a baking hot day for two reasons, one of them the heat of the sun. Have to go, the chickens are making a hell of a racket, seems that two hens are trying to get into one nesting box. The things I put up with to have the best and freshest eggs in the world ! To be clear; linguistic fashions in England shifted pronunciations, while colonists preserved the older forms. I will however recommend "The Life and Times of Noah Webster" by Harlow G. Unge if you desire clarity on the mindset and culture that inspired Webster to effectively unify and simplify American English. Merry Christmas to you too. Don't foget your hat as you're going out to get your eggs, WilliamRocket... Too much sun is bad for you! I prefer pentalith's answer, and I too hate gotcha questions. If you really want to avoid ambiguity you have to write things in an unambiguous way, which is increasingly difficult in today's world. Do you blame the writer who did not imagine that a sentence (or piece of code, whatever) might be interpreted in multiple ways or the reader who was not able to imagine what was in the mind of the writer? Neither, obviously. Ambiguity is what it is, and humans have an exquisitely practical tool perfectly adapted to eliminating ambiguity. I am a language editor for a scientific journal and I encounter ambiguity all day, every day; never once would it occur to me to lay blame or say gotcha. I simply ask the author, Did you mean this or that? Nobody told me there would be any math today. This is not about being dumb. This is about being set-up to forget a basic arithmetic grammar rule. If you plug this into Microsoft Excel, exactly as written, you get 61. It's been a long time since I've done any Fortran programming (maybe 45 years) but I think if you plug this into a Fortran program, exactly as written, I think you would get 1. That's way, as several other commenters have noted, you need to write this with the proper placement of parentheses to get the right answer.